Alaska in one of my favorite vacation places. It is moody and beautiful and ever-changing. It is a place worthy of more than a cruise ship visit from Vancouver or Seattle where you may only have hours in a port. It requires days of walking and hiking, getting to know the landscape and the people. It is more than one visit. Take your time and strike out on your own. Mt. 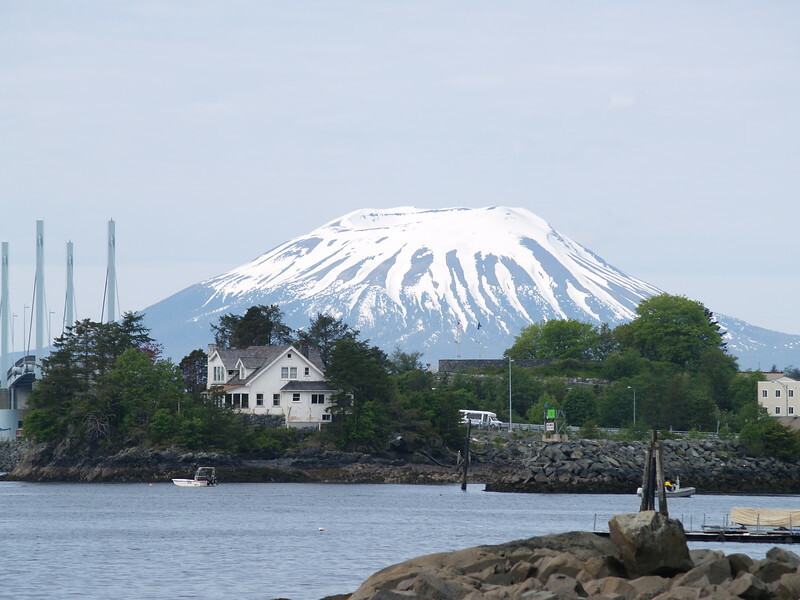 Edgecumbe, an exstinct cone volcano, is located on Kruzof Island, only 14 miles from Sitka. It provides a dramatic backdrop to the town. In the foreground are the support for the bridge to Japonski Island and the house of the publisher of the local paper. This photograph was taken in late May, 2007. The snow had melted up to the cone by the end of June.